Learn a proven set of tools for helping individuals and organizations lead on sustainability. The VISIS Method — which stands for Vision, Indicators, Systems, Innovation, Strategy — is a powerful open-source approach to sustainability and sustainable development in practice. 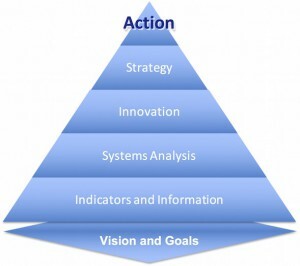 The AtKisson “Accelerator", a toolbox built on the architecture of VISIS, is a proven set of workshop, training, and analysis tools for getting groups and organizations oriented to sustainability; facilitating collaborative learning and planning; and helping sustainability “change agents” to be better ambassadors and leaders. “Accelerator Lite” is a free version, appropriate for educational and non-profit use; “Accelerator Pro” is the version used by consultants and in-house change leaders on sustainability. Both VISIS and Accelerator have spread to many countries, with decades of experience behind them. In this self-guided workshop, you will get a full introduction and virtual training in the use of these tools and methods by lead developer Alan AtKisson (an inductee in ISSP’s Sustainability Hall of Fame). AtKisson will explain the theory behind them, walk you through how to use them, and provide you with case studies and examples.